Guests line up to place bets as they attend a viewing party for the NCAA Men's College Basketball Tournament inside the Race & Sports SuperBook at the Westgate Las Vegas Resort & Casino on March 15, 2018 in Las Vegas. Sports betting won’t be available until the start of the NFL season in September. 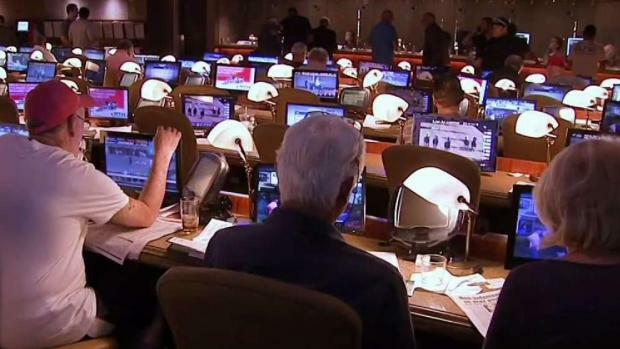 City officials had hoped to offer sports betting in time for opening day of baseball, but they say regulations and contracts still need to be approved before any bets can be placed. The city hopes by September betting at privately operated venues like Capital One Arena and Nationals Park could be up and running. Regulations are expected to go up for public comment in June. Then those regulations have to be adopted, which is expected in July. The ability to place bets with smartphones from anywhere in the city will not happen until January at the earliest. The city has to reach a deal with the vendor who will design the mobile app, then that contract has to be approved by the D.C. Council and Mayor Muriel Bowser. Then officials estimate six months to develop and implement the app. Ted Leonis, majority owner of Monumental Sports, which owns Capitol One Arena, said Wednesday the arena will get a betting venue that will accessible from outside the arena. The D.C. Council approved a bill legalizing sports betting in February. The bill allows the city to bypass the bidding process to give its contract to Intralot, the operator of the D.C. Lottery. This would give the D.C. Lottery the role of being the District’s sole gaming operator. The District is the first jurisdiction in the D.C. area to allow sports betting, joining the legalization trend in Pennsylvania, New Jersey and West Virginia. The NFL season begins on Sept. 5 with a game between longtime rivals, the Green Bay Packers and Chicago Bears. The Redskins 2019 schedule has not been released.